Kern is a text-based puzzle game for the iPhone and iPod touch in which players must move letters into the right location to correspond with a falling word. Slide the missing letter into the correct location, let go of the touchscreen and you’ll score a given number of points depending on where the rest of the word falls around the letter. Misalign a letter too far to either side of the falling word and you’ll lose a ligature (one of five life points). Lose all five ligatures and the game ends then and there. 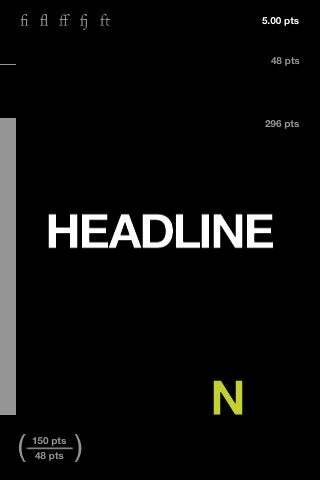 Line up the N in HEADLINE for points. Kern takes a simple approach to its graphics and sound, but the combined effort works out almost perfectly. A minimal-yet-stylish interface combines a fair amount of detail with good use of the iPhone’s screen real estate while a great use of tones and audio feedback prove you don’t need a symphony orchestra to convey the acoustic elements of a game. Kern occasionally froze from time to time under iPhone OS 2.2.1, requiring me to quit to the iPhone’s home screen and relaunch the application. And while the bare bones nature of the game makes it intuitive and easy to learn, the title can get repetitive at times and could improve from additional features such as a global scoreboard, additional music, score multipliers and other power-ups. Kern requires iPhone OS 2.2 or later to install and run.